1500m swim - 53:20 mins - 11th : I'm the 2nd last out of the water in my age group and I guess I'm the last 10 out of the water because as I reached the bike rack, only a few bikes were still hanging. lousy swim route/marking especially on the way back. 40km bike - 1:14:28 hours - 10th: I should have put on more speed but just because I want to play it safe and save my energy, aku control control sikit. I've managed to 'sayur' a few cyclists including 1 in my age group. I'm happy when I know that i'm no 10th.......yahoooo. 10km run - 1:05:47 hours - 10th: By the time I reached T2 and getting ready for my run, it was already 9am and it was hot. My run was not as expected but I managed to run (at a slow pace). Luckily the first half of the run was under the shade. 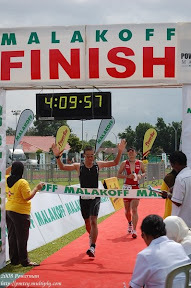 A few runners managed to 'sayur' me back including the guy in my age group. I was back to 11th place again. Bye bye my prize money. How am I going to catch him. After reaching the only water checkpoint, I ran, walk a little bit and run some more and walk again.....until to the finished line. At the top of the hill, I saw a guy walking 100 meters infront of me. So I ask the marshal what color is his BIB number and he said yellow. yeaaahhh.....I still have the chance to win back my 10th place. From there on I just follow him - walk and run with him (this is not the guy who sayur me just now, it's a different guy). He said he was tired and exhausted. After the last traffic light at the 4 junctions, I 've decided to run and get my 10th place winning. Note 1: The guys in my group are very strong and fast and all of them are very good swimmer and cyclists. Well done guys. Hopefully next year I will be able to swim side by side with you guys. Note 2: I'm happy especially with my bike ride and run. I'm just disappointed with my swim. I'm not going to blame the sea, its one of those things that we cannot control. strong currents with a few 'ombak' here n there. The marking of the swim course and explanation of the route should have been done better. With my swim time, it would be very difficult for me to participate in IRONMAN 70.3 apatah lagi the full IRONMAN. I need to improve my swim time to 45 to 30 mins. I'm way to slow. Maybe I need a new coach. The full official results will be uploaded later with ranking from 1 to 10 including the time. Pictures taken by my crews will be uploaded in a few days time and link to those photographers/photobloggers who have come and taken the photos will also be included. stay tune and keep on training. Next event is Panaga Triathlon 17th May 2009.